I glanced at my Writing Tips and discovered two things: 1) I was at the bottom. 2) The very last point was Character Dynamics—defined in such a way that my recent post on the Logic of Character fit that subject, even though I had not realize I was returning to my ongoing project. Raise the Stakes: To hook readers’ interest, make sure that some clock is ticking throughout the story, to keep the action moving. Check for public and private stakes. I am of two minds on raising the stakes, as I will explain further below, but first some basics. What do I mean by stakes? Easy. Just ask yourself: why is your character out slogging through the mud? Is it because she lost a nickel? Is it because she was late coming home from school? Is it because her car broke down after dark? Is it because her pet rabbit escaped and she is looking for him? Is it because her mother is ill? Is it because her three-year-old wandered out into the hurricane, and she cannot find him? Is it because her young son will be killed if she does not bring the diamond from the sacred chapel? Is it because her town, including her two children and her beloved aged grandmother, will be destroyed if she does not find the McGuffin in time? Is it because her entire country is about to be swept away by war? Is it because the fate of the earth is at stake and this is her last chance to save it? Is it because the Milky Way galaxy is about to be annihilated, unless she can find the Elixir of Hope? Is it because all universes in all dimensions are about to be blown away into nothing unless she can reach the History Alteration Switch in time? That is what is meant by stakes. Stakes are, very simply, what is at stake, what is going to be lost if the hero fails. When I first started writing I made the same mistake many new authors make. I thought the bigger the stakes the better. I mean, if the world is going to blow up if you don’t stop the war, that’s big right? Everyone cares about the world. That’s where we keep our stuff! The eye-opener for me was reading Donald Maass’s Writing the Breakout Novel. Maass divided stake into two parts, both of which were necessary for a good story. The two parts were personal and public. Look at the examples above. The first paragraph is filled with personal stakes: trying to get home in the rain; trying to help your sick mom; trying to find your lost child. Those are all things that pertain to the character’s personal life. Things that particularly motivate that one person. The third paragraph, on the other hand, is all about the public states: there is going to be a war; the earth is in danger; all universes and dimensions are on the chopping block. Those things affect everyone. They threaten the big picture. One can write a good story that only has personal stakes…a story about a family in a small town that has little bearing on the outside world, for instance. But one cannot write a good story that has only public stakes. No matter how big the public stakes are, what we are going to care about when we read the story is how those stakes affect the main character. What is he going to lose if all life everywhere goes kablooey? Public stakes make the plot more important. They increase the amount of damage that will be done if the heroes fail, so their mission is now a more serious one. Personal stakes make the plot more interesting. They increase the character’s—and therefore the reader’s—desire to succeed by increasing the effect of the plot on the character’s personal life. If you want to know how to do this, read Butcher or a Spiderman cartoon. Or, read a Spiderman book written by Butcher. Nuff said. Okay, putting the “how” behind us for the moment, let us move on to “why”. Why should I increase the stakes? Is it not enough that my character wants to do this and then he wants to do that and then he wants to do the other thing? Why should I artificially up the stakes to tie these actions together? Cannot my character just meander from one event to another? The characters in my favorite books do! Because, you are right. They do. Yesterday, I heard something on the radio that really frightened me. Was it a terrorist attack? A meteor headed toward earth? No. Nothing so important. It was an ad for the Voyage of the Dawn Treader. So, you can imagine how much I have been looking forward to this next movie. And yet, despite my bad experience with the third Harry Potter movie (my favorite book…but they left so much of what I liked out that I didn’t like the movie much,) it had not occurred to me to be antsy. Oh-oh! Save Narnia? From what? There’s no saving Narnia in Dawn Treader! I rushed home and jumped on the computer, putting “journey to save Narnia” into Google. I found an interview with the director that calmed many of my fears. He explained that since the book was six unrelated adventures, they wanted something to tie the movie together, so they took a stray line or two from the book and turned it into a threat at home, to add a reason why Caspian needed to find the missing lords. Hmm…if all this does is add a bit of structure and they do not talk about it much, I will be okay with it. I do understand the differences between books and movies. Still, I will have to see that it works before I stop worrying. Which leads me to my point: a lot of older books do not have much in the way of stakes. There is something, but it is often slower or more indirect—the stakes in Dawn Treader were that the children from Earth had to get home again, and the only way they knew to do this was to keep going forward. Nothing big. Nothing that compelled the reader to turn pages. And yet, it is one of my all-time favorite books. Well, among other reasons, I do not care much for tense stakes. I like my characters to have the freedom to do things without fate pushing them around. But, I may be the only one. Stake sell. Which comes to my point. Let me use an analogy from cooking. In the old days, people cooked food. It was good healthy food, and folks liked it. Then, someone figured out that if sweet and salty taste good, sweeter and saltier taste better. They started adding extra sugar and extra salt. Wow! Their food was really tasty! People flocked to their cooking. Then everyone did it. Now all the restaurants add extra salt and extra sugar and all of the sudden our taste buds have been retrained to think that this is normal and good, plain food is bland.—but our bodies have not been retrained. What was healthy then is still healthy now, except we no longer have the proper taste buds to enjoy healthy food. But if you open a restaurant, what do you do? Do you make food the way you think you should, simple and straightforward? Or do you add all the sweet and salty stuff everyone else is, to get the business? Writing, I think has reached a similar impasse. The existence of so many high stakes stories makes it so that low stakes stories are harder to appreciate. Yes, it is true that a good overall stakes moves a story along at a rapid pace, makes it more interesting, and keeps the reader pinned in their seat. But does that necessarily make it a better story? Would have I enjoyed the Dawn Treader more if Lewis had added a reason Caspian needed to hurry along? Or would some of the charm have been lost for me? Mind you, I am not recommending that anyone fail to assign stakes to their story. I think it is especially important to assign personal stakes. Prince Caspian clearly had personal stakes invested in the voyage of his Dawn Treader. He wanted to keep his promise to look for his father’s old friends, he wanted to see the world beyond his borders, he wanted to see wonders and travel to places yet unreached. All that was wonderful. What I am suggesting is that we use the power of public stakes sparingly….like salt. Some recipes call for a lot. I tend to pour salt onto salad in huge amounts. Other recipes could do with very little. While we want to keep our reader’s taste buds intrigued, we do not want to overwhelm a light-hearted children’s story with a ticking clock that has dynamite tied to it. Most new writers tend to put in too little stakes rather than too much, so if uncertain, it is best to err on the side of more. But I do wonder if we are a bit too results oriented these days. 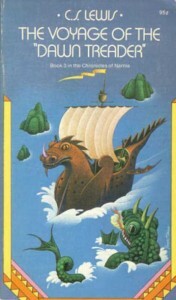 I want to make sure I live in a universe where Voyage of the Dawn Treader could still be enjoyed—less my favorite book of tomorrow never be written. Here’s to hoping that the movie does the book justice! November 17, 2010 in Wright's Writing Corner. ← Adopt Ping-Ping’s “Little Brother”!